Monday October 24 1910 I worked in the garrett all day and got it nicely cleaned up. Will went to town in the morning for the new top to the kitchen chimney I sent down a box of bottles to the drug store Ed [Kover?] helped Will put the top on the chimney just before night. Our supper was late. 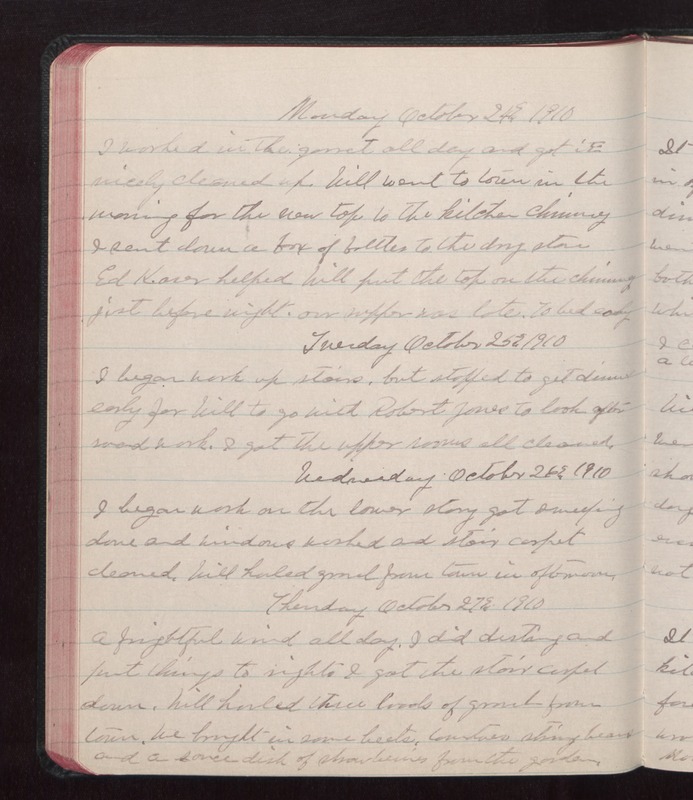 To bed early Tuesday October 25 1910 I began work up stairs. but stopped to get dinner early for Will to go with Robert Jones to look after road work. I got the upper rooms all cleaned. Wednesday October 26 1910 I began work on the lower story got sweeping done and windows washed and stair carpet cleaned. Will hauled gravel from town. We brought in some beets, tomatoes string beans and a [illegible] dish of strawberries from the garden.